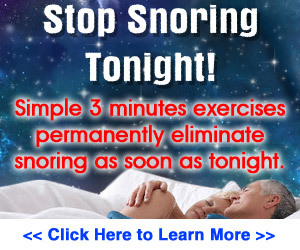 In day-time there is mouth breathing. Purulent rhinorrhoea (if there is secondary sinusitis) and epistaxis also occur, with or without nasal symptoms. There is hearing loss due to otitis media with effusion, or earache from recurrent acute otitis media. Adenoids normally regress before puberty and adults with large adenoids are rare. If an adult has nasal obstruction due to postnasal lymphoid tissue, the histology is essential to exclude a lymphoma. Nasal obstruction may occur from birth due to large adenoids, and the baby has difficulty with bottle and breast feeding. It is occasionally necessary to remove these "congenital adenoids" in toddlers. A conservative attitude should be taken, however, with removal of adenoids awaiting regression of the lymphoid tissue. Adenoidectomy alone is not common surgery. Tonsillar enlargement is usually also present, and is an additional cause of the upper respiratory tract obstruction and snoring. Fig. 3.14 Adenoids. A mass of lymphoid tissue shaped like a bunch of bananas occupies the vault of the postnasal space in children. If the adenoids are large, nasal obstruction occurs. Fig. 3.15 Lateral radiograph of adenoids. 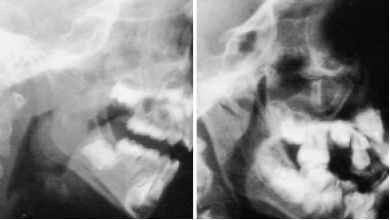 The postnasal space is often difficult or impossible to see in a child, and a lateral radiograph clearly shows the size of the adenoids and degree of obstruction. In this radiograph, a small airway is present (lower arrows) despite a large adenoid shadow (upper arrow). Fig. 3.16 Accurate lateral radiographs are necessary. 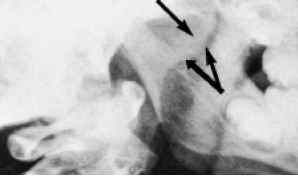 A wrongly angled radiograph (a) is not infrequently erroneously reported as showing "large adenoids." It is not easy to maintain a child in the correct position; patience and skill are required by the radiographer. When checking the lateral radiograph for adenoids, therefore, it is essential to be sure that the lateral picture is true (b) before assessing the bulk of the adenoid lymphoid tissue. This common injury only requires treatment if the septum is dislocated or involved in hematoma, or if there is an external deviation of the nose which is of cosmetic concern to the patient (a: seen frontally; b :most obvious when examined from above). It is important to reduce nasal fractures within two weeks, lest the bones cannot be manipulated and a subsequent rhinoplasty or refracture may be necessary. Reduction, therefore, is either carried out soon after the fracture or delayed until the edema, which makes assessment of the deformity difficult, has settled (usually within four to 10 days). 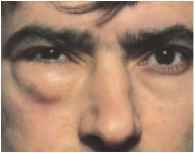 Many fractured noses, however, are "chip" or undisplaced crack fractures with hematoma, and require no treatment. Fig. 3.18 Surgical emphysema of the orbit. An alarming and unusual complication of a nasal fracture is surgical emphysema of the orbit when the patient blows the nose or sneezes. This is due to a fracture through the ethmoidal cells and lamina papyracea, linking the nasal cavity to the orbit. There is no cause for alarm, and if care is taken not to inflate the orbit, spontaneous healing follows. The characteristic crepitus on palpation is diagnostic. A facial injury that has caused a nasal fracture may also have involved the maxilla and anterior cranial fossa (with cerebrospinal fluid rhinorrhea), and precautions should be taken to exclude such an associated fracture as well as any possible injury to the eye. Fig. 3.19a, b Radiographs of nasal bones showing complete separation of one bone. In this case, the nasal bone radiograph shows some obvious and significant injury. In almost all instances, however, the radiographs for a fractured nose are of little practical value, although they may be of medicolegal significance. Fig. 3.20a-c A septal hematoma following trauma to the nose. 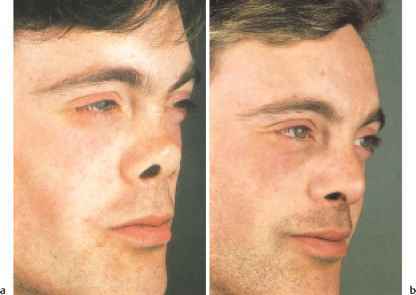 Blood collects under the subperichon-drium on both sides, causing "ballooning" of the septum and total nasal obstruction. If the nasal obstruction is total, early drainage of the hematoma is required. A warning must be given pre-operatively that nasal saddling of the dorsum may ensue, the hematoma having led to necrosis of the septal cartilage. Septal swelling with partial nasal obstruction usually settles spontaneously, and drainage is not necessary. The hematoma, if left, may become infected. 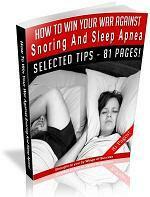 Pain and malaise accompany the total nasal blockage. Draining is necessary, and saddling is then common (see Fig. 3.21). 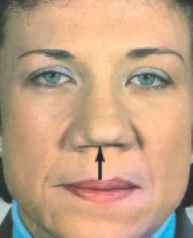 Minimal saddling, as in this patient (a) may accentuate a previous nasal hump. 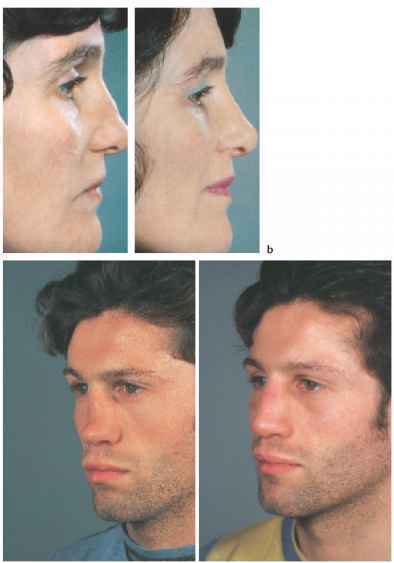 Simple lowering of the nasal bones restores the appearance of a normal nose ( b ). Fig. 3.22a, b A saddle nasal deformity following trauma, and a septal hematoma. This was repaired with cartilage graft taken from the concha of the ear. Fig. 3.23a-d Grafts. 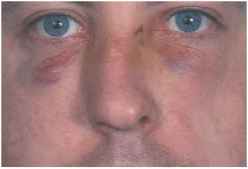 With more severe saddling, a graft is needed to restore the nasal contour. Cartilage, bone, or a synthetic are alternative grafting materials. Fig. 3.24 Iliac crest bone graft. 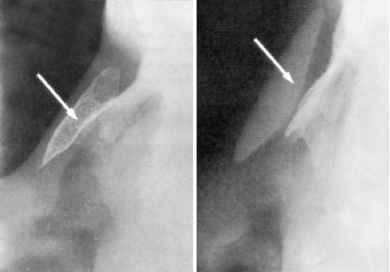 An iliac crest bone graft (arrow) used for a saddle deformity is demonstrable on this radiograph. Fig. 3.25 Synthetic graft. 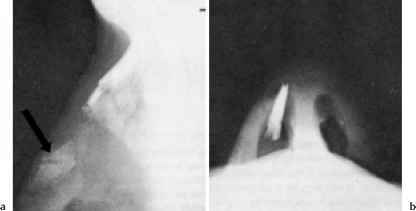 A synthetic graft (silastic) seen on radiograph (arrow), is also used to correct nasal saddling. Fig. 3.26 Septal hematomas in childhood. Septal hematomas are not uncommon in children, and may follow trauma or be spontaneous, in which case a blood dyscrasia needs to be excluded. The parents should be warned that the development of the nose may be retarded, and may lead to a "small" nose in adult life. In the past, surgical correction was left until the nose was fully grown at age 16-17, but it is now apparent that grafting of these saddle deformities in childhood will lead to more normal nasal development. a A childhood saddle deformity before grafting (age seven). b After grafting (age seven). 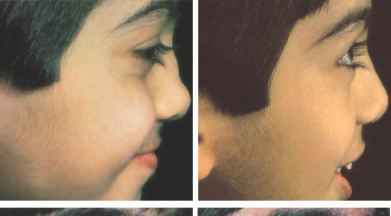 c Age 11. d A normal nose and not an infantile nose has developed as a result of grafting in childhood (age 19). Fig. 3.28 Retraction of the columella. Retraction of the columella (arrow) and loss of tip support of the nose are less usual complications of a septal hematoma. Fig. 3.27 Nasal plastic surgery. a A small infantile nose following a septal abscess in childhood. 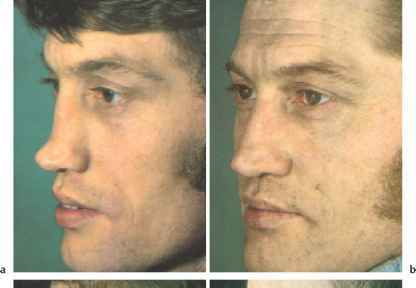 b Nasal plastic surgery using cartilage and composite ear grafts gives significant improvement. What to a baby that has a large post nasal space? How do i know if i have swollen adenoids in adults? What causes columella to retract adter rhinoplasty? What does swollen baby adenoids look like? How to cure septal hematoma?